While informal sessions continue until the first week of January, legislation requiring a formal recorded vote cannot be taken-up after July 30th. For this very reason, the Association’s legislative team will be working hard to advocate for the passage of the Mass Retirees’ legislative proposals. A top priority for Mass Retirees is H2567, An Act relative to future public retiree healthcare benefits. The proposal, sponsored by House Majority Leader Ron Mariano (D-Quincy), offers a comprehensive reform of future retiree health insurance benefits at the state and local level. 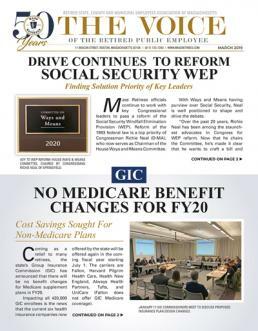 In doing so, the proposal also locks in certain benefit levels for existing retirees and survivors, as well as grandfathers all existing active employees under the current health insurance law. The bill also aims to address the critical and ongoing issue of cities and towns increasing insurance premium contribution percentages on existing retirees. It would mimic the state policy for its retirees by applying any increase prospectively and not retroactively. In late October, H2576 was favorably released by the Joint Committee on Public Service and is now before the Joint Committee on Healthcare Finance for further review. “We believe that every bill we file is a legitimate issue that should be addressed by the legislature. The difficulty in passing many of these proposals is that they cost a lot of money. In some cases, such as increasing the COLA base, we’re talking about hundreds of millions a year,” explains Legislative Director Shawn Duhamel. “These five areas, with health care being at the top, are the ones we’re most focused on going into 2018. That is not meant to overlook the other proposals we have pending, which are all important issues for which our work will continue,” comments Duhamel.